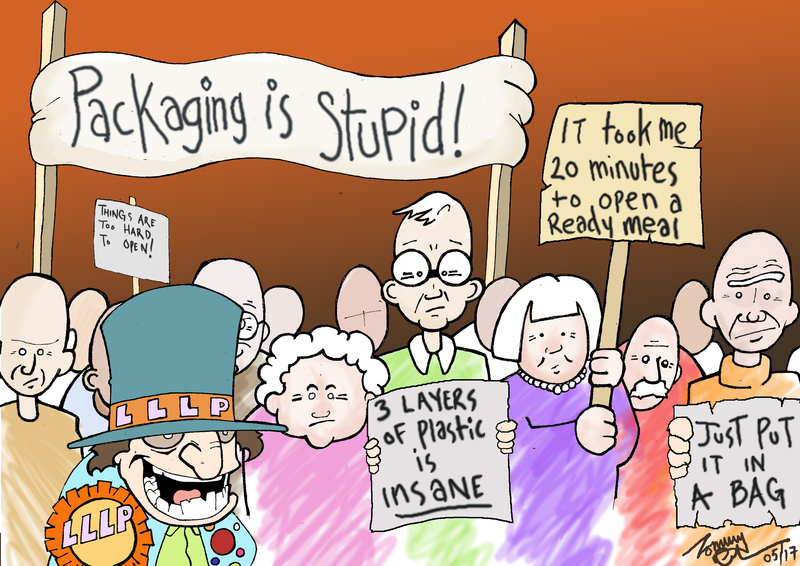 This week the Packaging Association had its annual awards ceremony. I will bet there were not many older people there ! In this election people are not taking the LLLP seriously enough. So today we are announcing our new policy on one of the big concerns for older people, which stops them quietly getting on with their lives in a stress free way. Child proof bottle tops are no better. They will also be outlawed in future. if you vote for the LLLP. Little children should be taught to not be nosey and leave things alone that don’t belong to them ! Well I will go to the foot of our stairs as grannies would say in the north! This blog is unsympathetic towards packaging, and how ones fingers as one grow older become less dexterous, and flexible to open/undo the packing of small and large goods and items in this modern world of ours, and the sensible decision by the ‘’Last Laugh Looney Party’’ to save any money on packaging to the helpful nurses who are prepared to listen within the NHS, it is wonderful! I had an encounter the other day with my granddaughter and her daughter of 4years old. WE were visiting for the afternoon a local folk museum [all olde world 20th century junk, of just plain living-The wash tub and rubbing board were there, and many other things, including an informed attendant. Our 4 year old great granddaughter was intrigued by the items and toys of a typical toy room and parlour, and allowed indeed encouraged to make them work, by the attendant. Great fun was had by all. Then we wished to proceed to further sections of the museum, and thanked and wish the attendant a good day. As I left the room in which we were, I noted the PIANOLA was an item of musical furniture sold by a LEEDS emporium, and mentioned this to the attendant, and stated my youth was spent many a day in the Leeds Area: Well is was like shouting house at a game of ‘Bingo’ in the local Mecca centre. The attendant came from Leeds, and hey bingo we came from the same village, well we talked, and as one may say about packaging the foil came off, the cling film came unwrapped, and as we were about the same generation, the memories become unfurled and fluttered like flags in the wind. Words I was aware of places I had known this grandpa had a wonderful time down memory lane-‘Spike and Malaice’ Apperly lane, crag wood, woodhouse grove school, the Thames Clyde express north and south thundering up and down past Apperly Bridge on the LMS Leeds Carlisle line, the billing, hills and holes, the three sisters, Rawdon golf and tennis club, the princess and the emmott’s, it was all too much to take in, but a great trip down memory lane. What made it more remarkable was the coincidences, I had left Rawdon in 1959 to go to college and sea, moved around a bit, and worked and lived in Bedfordshire/Buckinghamshire area as a family man since 1976. The attendant who was of my generation some years younger had left Rawdon in 1976, and worked many a place, but now as a retirement hobby works in the local folk museum, from time to time, so how we met is all down to a wish to entertain, amuse and educate our great granddaughter! The last laugh looney party knows no bounds, and by choice of even coincidence may talk sense and make sense? So please vote on polling day, I may meet you at the polling station or the celebration party when and where the results are declared. It is good to TALK?